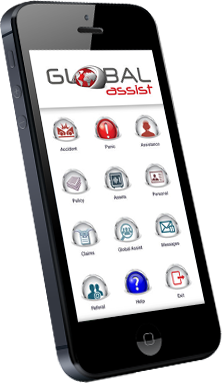 Global Assist provides Industry leading App and technology solutions to the Insurance Industry. Global Choices is adding value to Life. Watch our video to see how we are changing insurance related value added services with our Global Assist App.. Global Assist provides you access to a suite of Assistance Services to keep you and your family safe. All branded apps come with free Family Assist benefits, enabling multiple downloads of panic buttons and essential medical rescue services. Global Choices One Assist is an end-to-end value added solutions company, specialising in the short and long term insurance markets; healthcare; retail; and vehicle finance. Using state of the art technology and the best service providers, we're able to offer you what you deserve - choice. Pick and choose what works for you and your customers from various emergency and assistance services, branded as your own, backed by a 24/7/365 call centre. our social media pages to find out more about us.